Wondering how some people seem to keep a clean home while you’re spinning in circles? Get my best home cleaning routine tips for creating a clean home and keeping it that way. Having a home cleaning routine is essential to keeping our home neat and myself sane. I’m not sure about you but I get really excited about a fresh clean home, especially after coming out of lots of sickness and germs. A home cleaning routine is very important in maintaining a good family life and although my home isn’t picture perfect, I do like to keep it clean. What I have discovered is most people, myself included, start out with the wrong mindset about how to clean. We tend to look at it as a chore instead of a privilege. Say what? Stay with me here…I know we have always called cleaning a chore (an unpleasant but necessary task) but I think if we change our mindset about the process our home cleaning routine will become more enjoyable. If you have a place to live then cleaning it should be joyful. It’s a heart change really. I truly hope this gives you something to think about, I know it helps me. Now more about cleaning. The most important part is not the products you choose to clean with but instead the way in which you go about your cleaning. Sure, I prefer some cleaning products better than others but sometimes it really is preference. If you like all natural products then you will like something different than others. If scents are what you love you will choose a different product. The essential part of the cleaning process is making sure you have them all on hand before you start the cleaning process. Once you have all of your cleaning products you are ready to get started, right? Not so fast. Do you have a home cleaning routine? The routine doesn’t have to be a huge list of detailed cleaning but a plan in place to move around your home from room to room. Some people will want to finish one room all at once and others will prefer cleaning all of the same items, for instance, ceiling fans, toilets, etc. I recommend you clean room by room as needed when time is limited in order to have a sense of accomplishment. 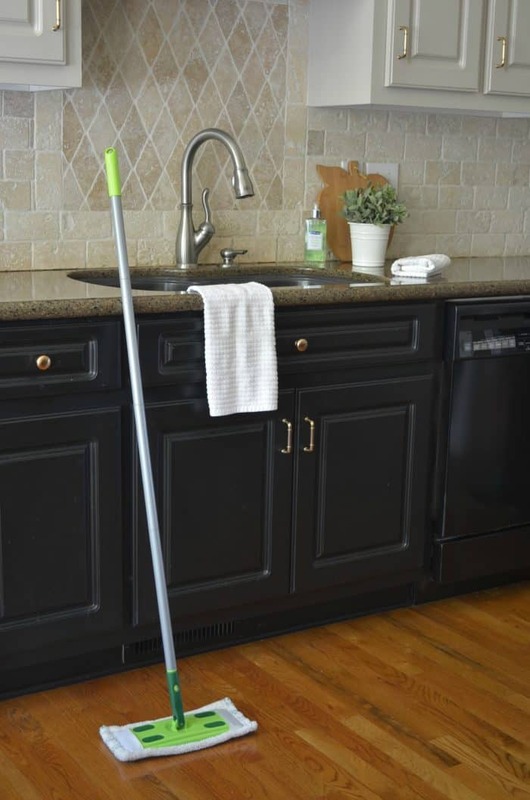 When you have more hours to spend on your home cleaning routine, like deep cleaning, it’s best to work your way through each item one at a time. As far as maintaining a clean home on a daily basis I find that tunnel vision is best. Pick a room and clean it first before moving on. Have you ever heard the old saying, “I’m cleaning this house from top to bottom.” I’m sure I’ve said it many times but I also heard it growing up. I never really put it into context. Work you way through your home from top to bottom, literally. Start with the ceiling fan/light fixture making your way eventually to the floors. This allows all dust and dirt to fall and you will get it up as you go. No need to have to do double work. Once you have your cleaning routine supplies and a joyful heart you are ready to go. I would love to know what you do to maintain a clean home. It’s always interesting and usually helpful to hear what others do. How I get my hardwood floors to shine can be seem HERE. Once your home is clean it’s time to start decluttering!